RuneScape's combat is exciting and challenging, with many different options and abilities to choose from. Thousands of armour and weapon combinations are available, and the strongest players are those who prepare well for battle. Players can try to defeat hundreds of different NPCs as they progress with their adventure or can engage in combat with other players in dedicated PvP areas. Read on to find out why Combat is such a huge part of RuneScape's gameplay. The first choice you'll need to make is which of RuneScape's two combat systems to use. A dynamic, modern combat system based around on-click abilities. It can be played fully manually or semi-automated, and allows for exciting, visually impressive battles. It's a great way to play at all levels, and is strongly recommended for challenging, late-game boss encounters. Basic - These abilities are quick, usually damage based, abilities that can generate Adrenaline. Adrenaline is used to perform more advanced and stronger abilities such as threshold and ultimate. Threshold - Threshold abilities do more damage than basic abilities, but they also drain 15% of your adrenaline when cast. Threshold abilities require 50% adrenaline to use. Ultimate - These are the most powerful of all abilities. Most of these abilities wipe your adrenaline bar completely, and do not generate adrenaline. Most abilities are unlocked as you train your combat skills but some can be obtained in other ways: as drops from powerful creatures, or through completing quests. You can also choose to automate your abilities by selecing Revolution as your combat mode. Choose Legacy combat to return to more nostalgic times from RuneScape history. It replicates the older combat system and includes subtle improvements that are valued by veteran RuneScape players. Although it may be seen as a simpler system, players who choose to use it are not penalised. Combat is much simpler - simply click on an enemy to attack them and your character will do all the work. Legacy combat interfaces are different to those seen when EoC is selected and you will see different options to choose from when deciding how to attack an enemy. 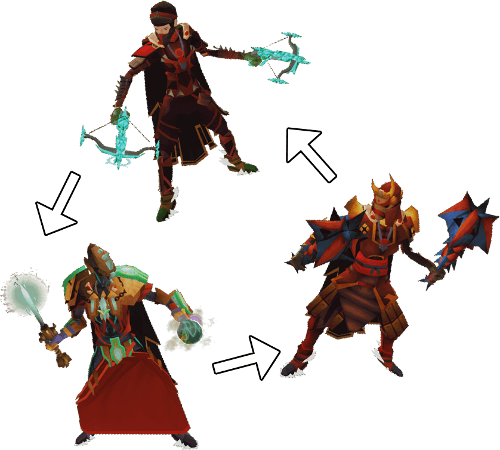 There are three styles of combat in RuneScape: Melee, Ranged and Magic. It is always worth considering your opponents' weaknesses when thinking of which combat style to attack with. Certain armours are weak to different weapon styles and it will give you a significant advantage if you play on these weaknesses. Ranged attacks are best against Magic users, but weak against Melee. Magic attacks are best against Melee users, but weak against Ranged. Melee attacks are best against Ranged users, but weak against Magic. Specific weaknesses will have a further bonus to your hit chance if you attack with these. For example, monsters with a weakness to bolts will be hit more often and receive more damage if you use a weapon that fires bolts over other ranged weapons. Specific weaknesses do not come into play for PvP - only the overall style. EoC reinforces the bonuses and penalties imparted by the combat triangle. In Legacy, these are slightly relaxed. In EoC mode, you will see information about enemy weaknesses in the target information interface, which displays above your target's head. Legacy mode users will not see target reticules or the target information interface. Life points are represented by the green and red bar above your head during combat. Should your life points reach 0, you will die. To avoid death, you can heal during a fight by eating food. If you find you are losing a battle, then you can run away by clicking on the ground. If you do retreat it's best to keep moving, as monsters will pursue you and carry on attacking. If you run far enough away, monsters will eventually give up the chase. Gielinor is a dangerous place, and you may die as a result of combat. The three most valuable items you're carrying will be saved automatically. Certain items (such as quest items) will be saved separately from these. Others can be reclaimed for a price in gold coins. Death will hold onto your items for up to 24 hours or until you next die, after which they will be wiped. Alternatively, you can opt to return to your place of death and reclaim your non-saved items from your gravestone. Be aware, though, that there is a time limit, and if you don't get there in time (or you die again) your items will be lost! Upon leaving Death's house, you can choose from a number of respawn points. This point will always include Lumbridge, but you may find that your 'hub' - the last city you passed through - is included on this list, and a number of respawn points that you have unlocked via quests. 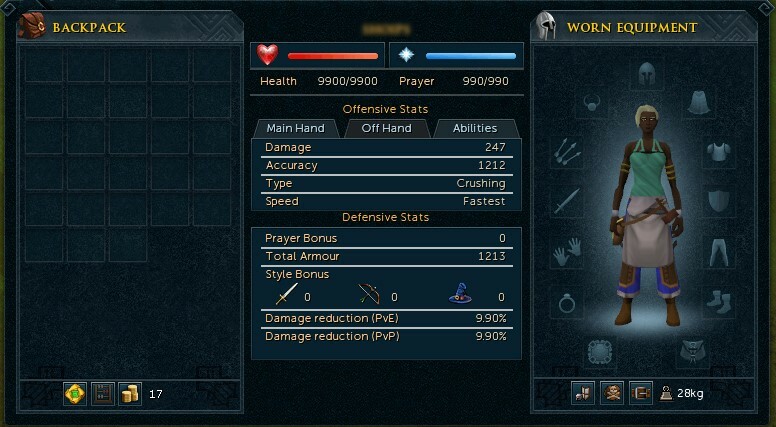 The Loadout interface can be accessed through the Gear interface, simply press 'F1' on your keyboard. This interface is where you can see what items you are wearing in each slot More importantly, the interface allows you to see just how much damage you are capable of doing, and how much damage you can deflect, under different circumstances.